Akron water cannons are the best in the business. From the small, manual MM40, right up to the fully remote controlled RM100 and beyond, Akron water cannons are the most sturdy and dependable monitors on the market. Built to be used and abused, these cannons can survive the harshest of environments. Akron spray head valves offer the most control and reliability of anything on the market. Built from the highest quality marine-grade alloys, with polymer inserts utilising the latest developments in materials engineering providing low-maintenance, low fuss water dispersal in all environments. 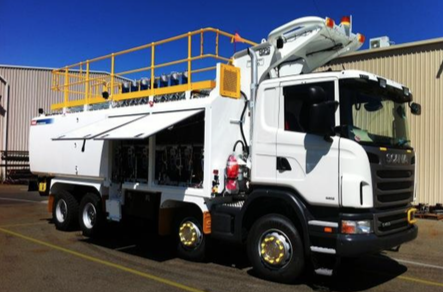 ￼Mackay Fluid Power offers repairs and maintenance service to Mining Service Trucks either on-site or at our fully equipped workshop in Mackay. Whether it’s a complete rebuild or just light maintenance our Fitters have many years experience and no job is too big or too small. ￼Our in house engineering team have designed and manufactured our own range of hose reel stands designed to your requirements, using quality heavy duty Hannay Reels. We’ll custom build a Lube Container to suit your specifications and dimensions, quality brand Pumps and Hose Reels accompany these designs which can be fully self-contained with the inclusion of Work Bench, Lighting, Generator and Compressor. Mackay Fluid Power are pleased to offer our customers with an On-site Installation and Commissioning service. You can be guaranteed that Mackay Fluid Power are available to provide support for any application. We can provide on-site support for our manufactured and engineered product range, with our qualified service technicians who are able to meet your expectations. Mackay Fluid Power endeavour to form strong partnerships with our customers to ensure there is minimal downtime attained by ongoing scheduled maintenance. 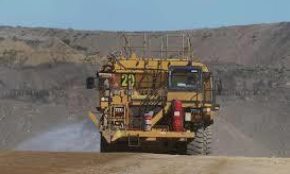 Mackay Fluid Power are capable to provide qualified tradesmen along with mine site compliant service vehicles to carry out scheduled maintenance and tool audits on site. Fuel Farms and refuelling systems.